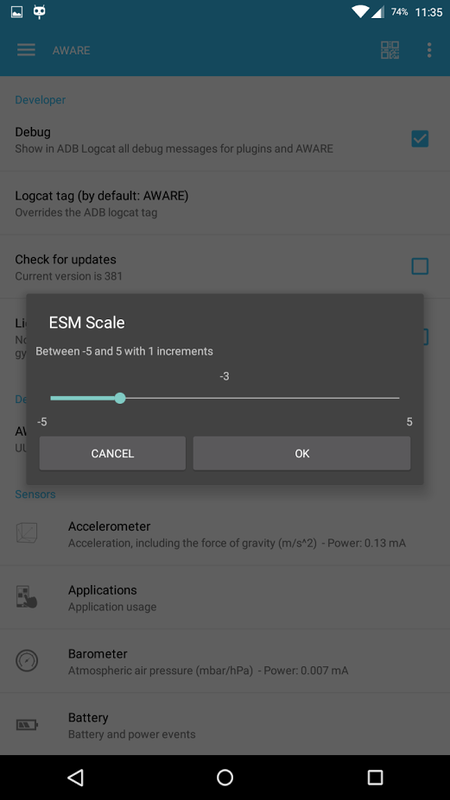 The ESM sensor adds support for user-provided context by leveraging mobile Experience Sampling Method (ESM). The ESM questionnaires can be triggered by context, time or on-demand, locally or remotely (within your study on AWARE’s dashboard). Although user-subjective, this sensor allows crowdsourcing information that is challenging to instrument with sensors. ESM.queueESM( Context context, String esmJSON ): Adds ESMs (the string representation of JSON) to the queue. 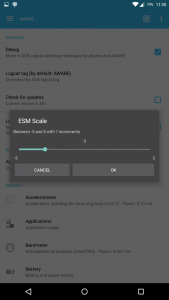 Aware_Preferences.STATUS_ESM: true or false to activate or deactivate ESM sensor. esm_expiration_threshold: how long the user has to answer the question after it is displayed in the screen. 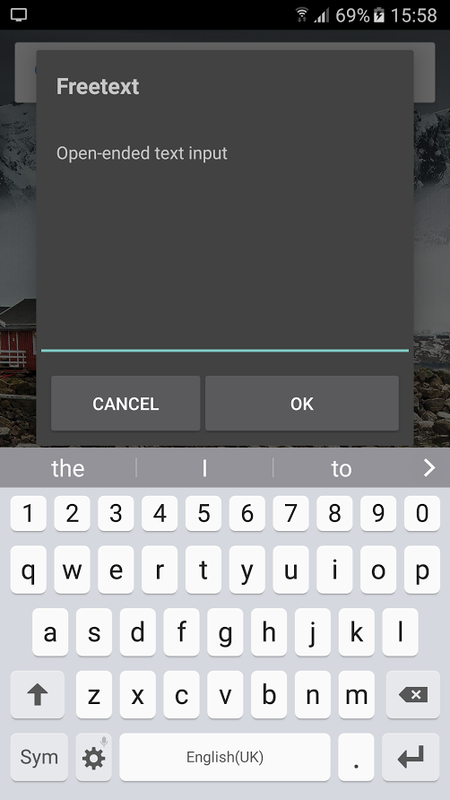 The timer stops when the user touches the dialog. 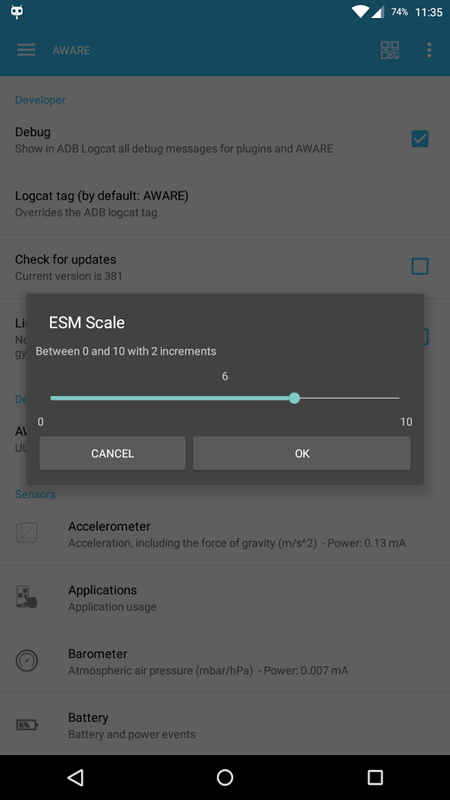 The ESM does not expire if set to 0 (zero) and will show a notification in the notification bar. 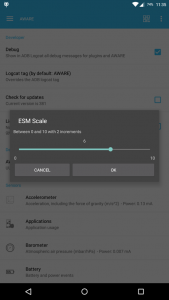 If set to anything > 0, the ESM instantly prompts the user to answer the questionnaire, and will expire if the user has not touched the dialog. esm_notification_timeout: time after which the ESM notification is dismissed and the whole ESM queue expires (in case expiration threshold is set to 0). esm_trigger: a freeform string you can define for what could have triggered the ESM, useful for traceability and data analysis. NOTE: Answering an ESM is never mandatory. If the user presses the Home or the Back button, the ESM is dismissed. We track the ESM statuses: new, dismissed, expired, branched or answered. An ESM does not have a default answer, i.e., if no answer as given, it will be blank. 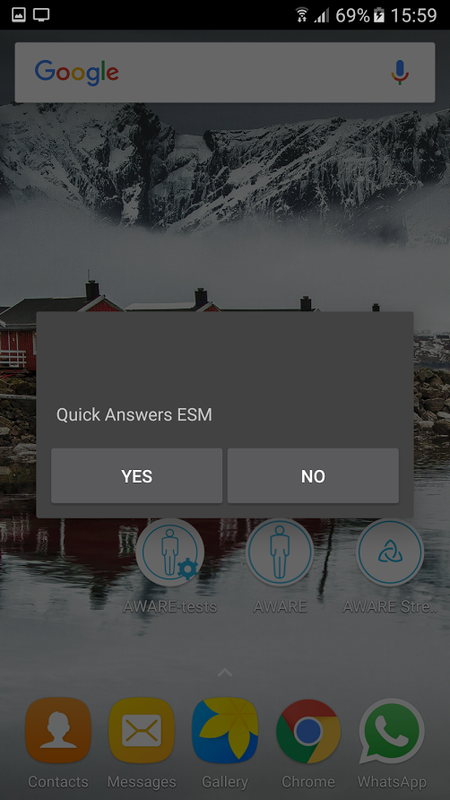 ESM.ACTION_AWARE_ESM_ANSWERED: broadcasted when the user answered an ESM question. ESM.ACTION_AWARE_ESM_DISMISSED: broadcasted when the user dismissed an ESM question. ESM.ACTION_AWARE_ESM_EXPIRED: broadcasted when the ESM expires. ESM.ACTION_AWARE_ESM_QUEUE_COMPLETE: broadcasted when there are no more ESM questions on the ESM queue. ESM.ACTION_AWARE_ESM_QUEUE_STARTED: broadcasted when the first ESM question from the queue of ESMs is presented to the user. ESM.EXTRA_ESM: a string with a JSON array with the ESM definition, see previous section. We have revamped how we build and queue ESMs to make it more user friendly and less error prone (moving away from having to write JSON objects!). To create an ESM queue, we now use the Factory software design pattern. Here are some examples. 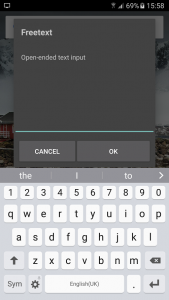 This ESM allows the user to provide free text input as context. This can be leveraged to capture sensor-challenging context, such personal opinions. 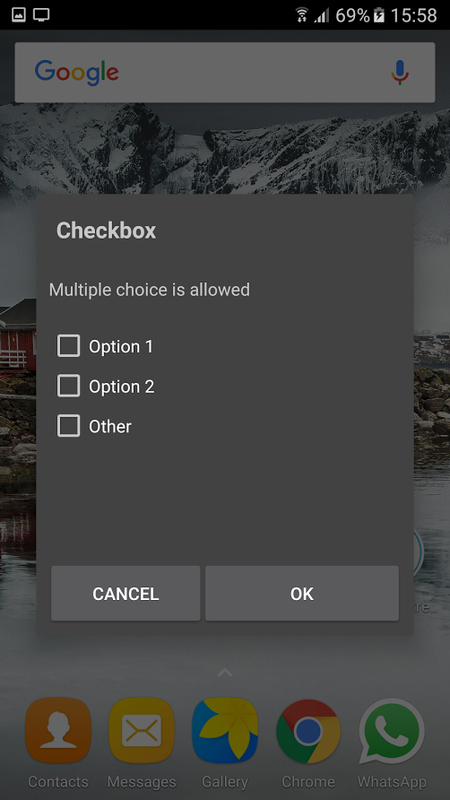 This ESM only allows the user to select a single option from a list of alternatives. 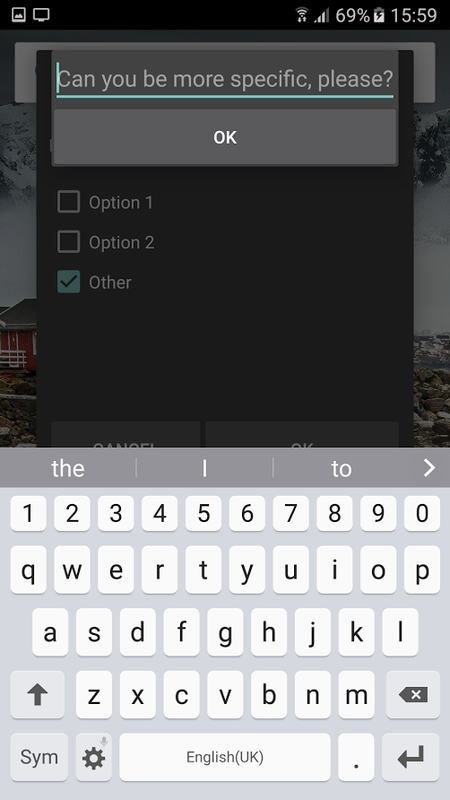 One of the options can be defined as “Other”, which will prompt the user to be more specific, replacing “Other” with the users’ defined option. This ESM allows the user to select one or more options from a list of alternatives. Similar to the Radio ESM, one of the options can be defined as “Other”, which will prompt the user to be more specific, replacing “Other” with the users’ defined option. 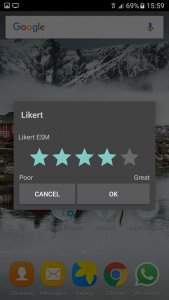 This ESM allows the user to provide ratings, between 0 and 5/7, at 0.5/1 increments. The likert scale labels are also customisable. The default rating is no rating. 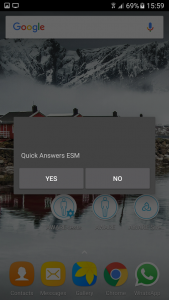 This ESM allows the user to quickly answer the ESM. The button arrangement is fluid, to support more or less inputs. Keep in mind that a dialog can only grow as much as there is screen estate and we don’t recommend more than 6 items here. Unlike previous ESMs , there is no “Cancel” button for this type of ESM. 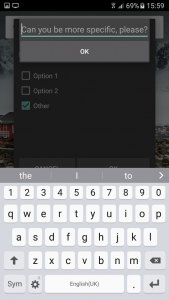 However, the user can dismiss the questionnaire by pressing the Home or Back button on the device. This ESM allows the user to select a value within a range of values. The range can be positive (e.g., X to Y) where X and Y are both positive numbers; or negatively balanced (e.g., -X to X), where X is the same value. This ESM allows the user to provide numeric input. Numbers inputted by the participant can be both full numbers and decimals. 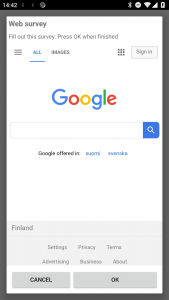 This ESM allows you to ask the user to answer an online survey. Please check a tutoral for developing ESMs on iOS or iOS ESM plugin.